This article was originally published on Grist. 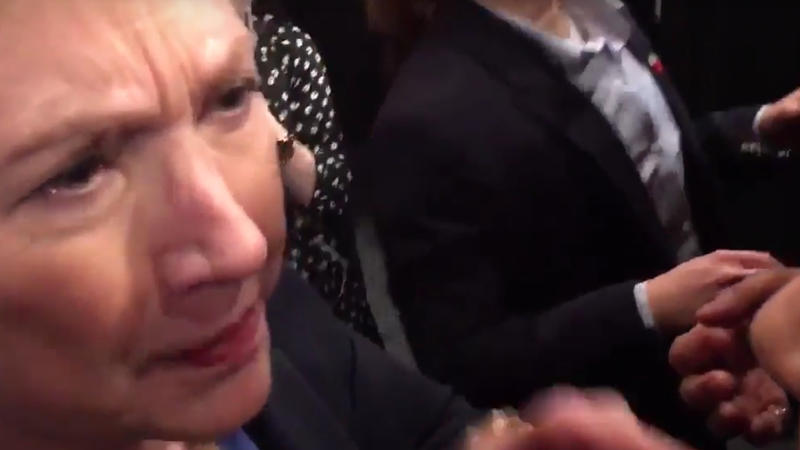 Hillary Clinton got cranky on Thursday when an activist confronted her about donations from fossil fuel interests. Although the Sanders campaign is using the issue to draw contrasts with Clinton, the questions to Clinton about fossil fuel money are actually coming from grassroots green groups. A coalition of 20 progressive and environmental organizations, including Greenpeace, 350.org, and Friends of the Earth, has been pressing the presidential candidates to pledge not to raise money from “fossil fuel interests.” Bernie Sanders has already taken the pledge, so the activists are badgering Clinton. Just one day before her confrontation on the rope line, Clinton was greeted by protesters pushing the same message outside a $2,700-per-head fundraiser in Manhattan. Greenpeace brought about 40 activists to stand in the blustery cold near the Dakota, the iconic building on Central Park West where John Lennon once lived, and which is now home to the woman who hosted Wednesday night’s fundraiser, Ruth Porat, former CFO of Morgan Stanley and current CFO of Alphabet, Google’s parent company. The location lent credence to the people-versus-the-monied-establishment message that the activists were pressing. The police blocked off the sidewalk immediately in front of the building and penned the activists into a barricade across the street. There they patiently held signs with slogans such as, “Democracy: Not for $ale” and “I can’t afford to buy your time but you can afford to take our pledge.” The largest banner read, “Hillary will you come out and talk to the people you’re fighting for?” They chanted phrases like, “Hill-a-ry, take the pledge,” “We are the 99 percent,” and “I don’t know but I’ve been told, your campaign is bought and sold!” One protester wore a Hillary Clinton mask and a body suit covered in dollar bills. Clinton ignored the crowd on her way in, and gave them nothing but a wave when she left. After Greenpeace released the rope-line video on Thursday, the Clinton campaign put out a statement saying the candidate “has not taken a dollar from oil and gas industry PACs or corporations.” That’s true, she hasn’t taken money from the companies themselves. She has, however, by her own admission, accepted money from individuals who work for fossil fuel companies. As of the most recent filing deadline, the Clinton campaign had received $309,107 in donations from oil and gas company employees. According to data compiled by the Center for Responsive Politics, Sanders too has gotten money from individual employees in the oil and gas sector, just not as much — $53,760 so far. “We’re checking to see if any of that 50K came in after he signed the pledge, and if it did, we would certainly call him out on it,” Greenpeace spokeswoman Molly Dorozenski wrote in response to a query from Grist. The Sanders campaign did not immediately respond to a request for comment as to whether this violates Sanders’ pledge not to take fossil fuel donations. Even though Greenpeace plays up the amount Clinton has gotten from fossil fuel company employees and lobbyists, Dorozenski argues that Clinton could afford to forgo the donations. “It’s not such a huge amount; she doesn’t need the money,” said Dorozenski on Wednesday. Taking the group’s pledge and giving up money from fossil fuel lobbyists “would be a smart move to reach out to people who are voting for Bernie,” she argues. Clinton has contended that it doesn’t matter if monied interests such as Wall Street bankers donate to her campaign because she is not formulating policy for their benefit. The protesters lined up outside the Dakota on Wednesday responded to that line of reasoning by pointing out that those who donate generously get a direct line of communication to Clinton and the rest of Americans don’t — a hard argument to rebut when Clinton was meeting with a small group of large donors at that very moment. Climate hawks want Clinton to endorse ending fossil fuel extraction on public land and eliminating the “Halliburton loophole” that exempts fracking from some environmental regulations, as Sanders has. Since both of those policies would cut into fossil fuel companies’ bottom lines, the activists worry that Clinton will be less likely to take those stands if she accepts money from people affiliated with those companies. The people “wouldn’t be donating if they didn’t think they would get something out of it,” says Resnick-Day. Effective activism sometimes requires irritating the powerful. That’s how you know it’s having an impact. Ben Adler covers environmental policy and politics for Grist, with a focus on climate change, energy, and cities. When he isn't contemplating the world's end, he also writes about architecture and media.